Autoimmune urticaria is a distinct subgroup of chronic urticaria associated with autoantibodies to immunoglobulin E (IgE) receptor alpha-subunit and IgE itself on mast cells and basophils. These autoantibodies cause basophil and mast cell activation resulting in histamine release and causing urticaria. The disease is poorly responsive to even high doses of antihistamines. Immunosupressives are indicated when the disease is disabling. Cyclosporine is a steroid-sparing drug found to be effective in autoimmune urticarial through the inhibition of release of histamine from basophils in patients of chronic urticaria with anti-FcεRI autoantibodies. 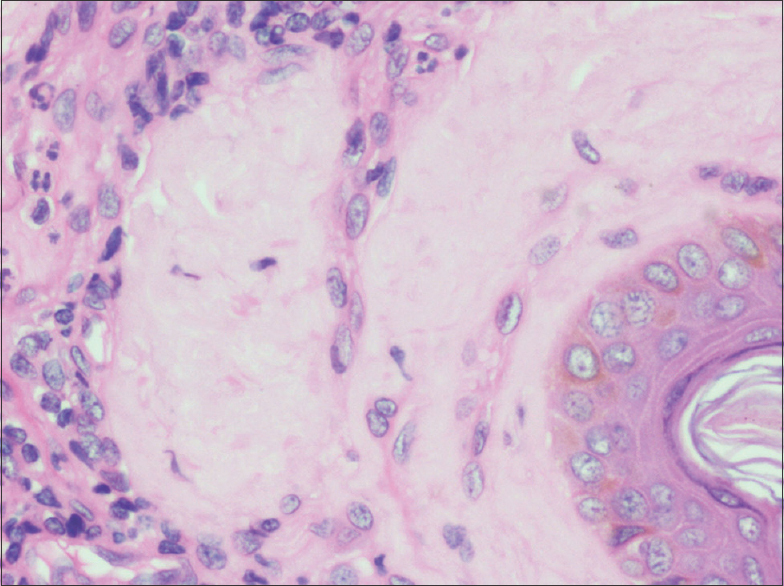 We report a 22-year-old man with a history of weals of 2 years' duration. Each weal lasted for more than 24 h, relieved partially with full doses of sedating and updosed dosage of nonsedating antihistamines. There was no history suggestive of angioedema, fever, joint pain, burning sensation, or hyperpigmentation after the resolution of weals. Histopathological examination of weal showed sparse perivascular lymphohistiocytic infiltrate with occasional neutrophils and eosinophils; few of the small caliber vessels showed intraluminal aggregates of neutrophils in the absence of vasculitis [Figure 1]. Autologous serum skin test was done after discontinuing antihistamines for a week which was positive at 5 mm. A diagnosis of autoimmune urticaria was made, and the patient was initiated on oral cyclosporine at a dose of 3 mg/kg/day. Weals resolved after initiation of cyclosporine, and the patient was maintained on the same dose for 2 months and was planned to taper it over a total of 4 months. 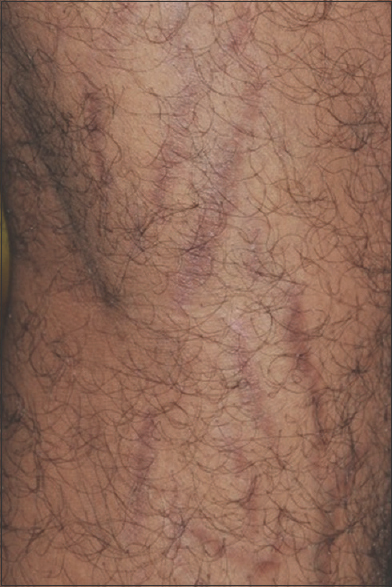 Two weeks after starting cyclosporine, he started to develop striae on lower third of thighs and calf of both legs [Figure 2]. There was no other contributory factor for the development of striae distensae including history of sudden gain or loss of weight, topical or oral steroids, and intake of native medications. Naranjo adverse drug reaction probability scale for cyclosporine causing striae in this patient was +4 indicating probable causality. The various possible etiologies for the development of striae distensae include genetic predisposition, mechanical factors, and more importantly hormonal factors. It is frequently seen in Cushing's syndrome due to excessive serum cortisol causing activation of fibroblasts resulting in protein catabolism altering elastin and collagen. Severe urticaria with positive autologous serum skin test has been found to be associated with low cortisol levels. We speculate the development of striae which coincides with clinical improvement after cyclosporine therapy is probably due to hormonal changes, namely cortisol. Association of striae distensae with cyclosporine therapy for autoimmune urticaria is yet to be reported in literature. Awareness about the occurrence of this side effect with cyclosporine will open new insights into detailed evaluation of the causes in future. Goh CL, Tan KT. Chronic autoimmune urticaria: Where we stand? Indian J Dermatol 2009;54:269-74. Inamadar AC, Palit A. Management of autoimmune urticaria. Indian J Dermatol Venereol Leprol 2008;74:89-91. Boubouka CD, Charissi C, Kouimintzis D, Kalogeromitros D, Stavropoulos PG, Katsarou A, et al. Treatment of autoimmune urticaria with low-dose cyclosporin A: A one-year follow-up. Acta Derm Venereol 2011;91:50-4. Al-Himdani S, Ud-Din S, Gilmore S, Bayat A. Striae distensae: A comprehensive review and evidence-based evaluation of prophylaxis and treatment. Br J Dermatol 2014;170:527-47. Varghese R, Rajappa M, Chandrashekar L, Kattimani S, Archana M, Munisamy M, et al. Association among stress, hypocortisolism, systemic inflammation, and disease severity in chronic urticaria. Ann Allergy Asthma Immunol 2016;116:344-80.